New York, July 1, 2015	(Newswire.com) - New York has been a great inspiration for Annalisa Conti in her years spent in the city: despite a business strategy daily job, the city’s energy and its stunning beauty keep nourishing her passion and inspiration for writing. 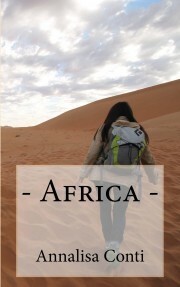 Her second novel, Africa, has been published by AEC Publishing (www.aecpublishing.com) and it is now available on Amazon for Kindle and Paperback (http://www.amazon.com/Africa-Annalisa-Conti/dp/0996517413); it will soon be distributed by several other retailers. Amber Stevens is an entertainment journalist in New York City, a movie lover who has the job she had always dreamed of, and a life with her beloved husband Michael that perfectly suits both of them. When a phone call wakes her up in the middle of the night, Amber’s life is crushed, and her whole world crumbles down: nothing will ever be the same again. Now Amber has to make a choice: let herself fade away, or find a way back to life. Pushed by the affection and determination of her best friend, Amber will have to rediscover her true self in an unexpected journey through the eternal landscapes of Africa. Annalisa Conti builds another very intimate quest to explore the truth about people: if All The People was an inner research, a journey to decode a woman’s mind, Africa places its main character in close contact with the external world and its wonders, in an environment so completely different from Amber’s own that it will force her to look deeper inside her soul and face that diversity. The reader is constantly pushed and pulled between astonishing encounters and stabbing emotions, in a revealing travel across Southern Africa.